A bezel setting is a type of diamond setting that wraps the diamond completely in a ring of metal around its girth instead of using thin prongs to hold the ring. This provides a protective cushion of metal around the widest part of the gem, and also creates a frame to highlight the stone. Bezel settings are particularly popular in older, retro ring designs as well as more subtle styles. This setting is an excellent choice for brides-to-be who prefer a protected diamond but who are also like a classic, elegant engagement ring design. Emma Parker & Co: This jeweler carries an extensive selection of bezel set rings in varying sizes ranging in price from just over $500 to just under $5,000. Kranichs: Kranichs Jewelers carries a lovely bezel set engagement ring from the Scot Kay vintage collection, as well as other options. The price is not published online, but you can request it through the website. Since 1910: This family-owned jewelry store carries a bezel setting sized to accommodate a 1 karat round diamond. The setting is just under $400; add your own diamond or purchase one from the jeweler. Shiree Odiz: This jewelry store carries a wide selection of bezel set engagement rings priced between $1,200 and $12,000. These are only a few of the main available options. Most jewelers offer a variety of bezel settings for couples to choose from, and online merchants also offer a range of different styles to meet different couples' expectations. 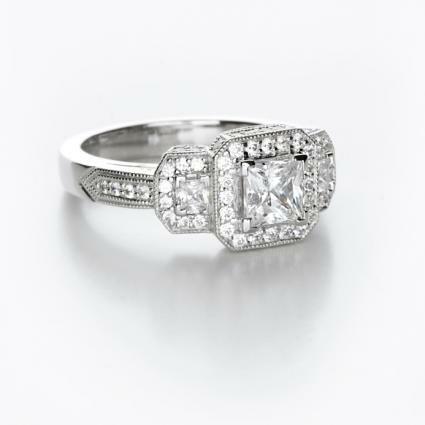 As with any engagement ring, prices vary based on the diamond quality, type of metal, and craftsmanship of the ring. Bezel settings are popular for many brides-to-be, including women interested in a classic, vintage style without the predictable prongs. Women who need rings that have a lower profile - doctors or nurses, for example - can wear a bezel setting without undue risk, and women who frequently wear gloves or who participate in hands-on activities may prefer the subtlety of a bezel setting. Bezels are also excellent contemporary styles and can be brilliantly enhanced to make a powerful statement about a woman's jewelry tastes and fashion preferences. There are a few benefits of bezel settings, as well as a few drawbacks. Because the diamond is thoroughly protected, these rings are generally better able to withstand rougher activities than other types of settings. The metal surrounding the stone can help conceal diamond flaws and inclusions, thereby enhancing the ring's beauty. A bezel setting can distort a diamond's true color by adding a tint to the gem because it completely surrounds it and less light is able to penetrate the stone. This effect can be lessened, however, by choosing a platinum or silver bezel that may help brighten a ring. While bezel settings may initially help protect a gem, if they are allowed to get dirty they can trap dust and dirt closer to the stone than open settings. This makes them challenging to clean, and more frequent professional cleanings may be necessary to keep a bezel set ring looking its best. Despite the fact that bezel settings are naturally more protective, they still require regular care to look their finest. Gentle cleaning should be done regularly to keep dirt, dust, and oil from building up along the rim of the bezel where the metal meets the stone. Sharp objects should never be used to remove debris - this could scratch and warp the metal. The ring's setting should be inspected periodically to ensure it is still snug against the stone and well balanced to provide optimal protection. If the setting is damaged, it needs to be professionally repaired and not subjected to taps or blows in an attempt to flatten the ring - misplaced blows can fracture the diamond and further warp the metal, requiring expensive repairs. A bezel set engagement ring can be a sleek, simple design or an intricate piece of jewelry artwork. The unique nature of this setting ensures that no matter what style adorns a bride's finger, it will be a creative focal point and a treasured possession for years to come.